Road Runner Girl: The Kindness Has Begun! Disclaimer: I am an ambassador for kindrunner.com. I will be doing campaigns involving product reviews and giveaways provided by kindrunner. As always all the opinions expressed will be mine and mine alone! A few weeks ago I told you about my new ambassadorship with Kindrunner.com! 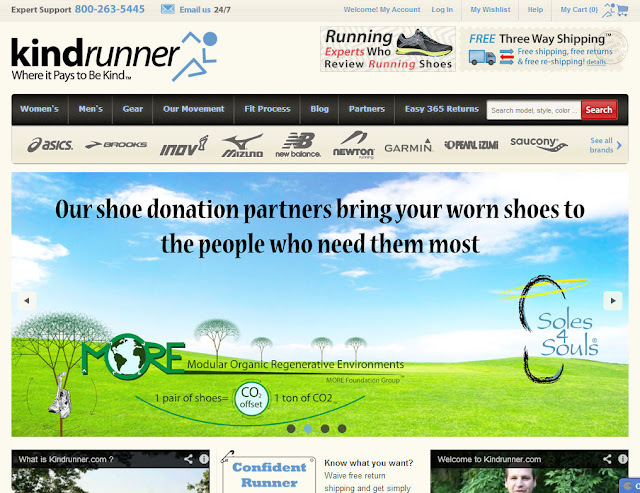 Well the date has arrived...kindrunner.com has officially launched! The website is now live and ready for the kindness to begin!!! Here are more details about kindrunner.com! What's cool is that no one else offers these features so it makes kindrunner.com a truly unique experience! Confident Runner Pricing: This option is presented at checkout and rewards those runners that know exactly what they want. This option offers the shoe at a below retail price (but waives the free return shipping). Shipping of the product to the runner is still free as well as the return shipping of donated shoes for the Kindness Cash Rewards Program. Free 3 Way Shipping: Free shipping of your order to you, free shipping if you need to return something, and free shipping of your donated shoes back to Kindrunner for re-purposing with Soles 4 Souls or The More Foundation Group. Kindness Cash Rewards Program: This turns your old shoes into credit for new shoes or towards any other product on the site. KCRs are available to the customer after any footwear purchase. The purpose is to keep your old shoes out of the garbage and landfills. Once you receive the shoes you purchased, there will be the option to place your old shoes into the Kindrunner shipping box and place the pre-paid shipping label onto the box and send it back to Kindrunner. When Kindrunner receives the label they will scan it and add the KCR into your account. Each return label (whether it contains 1 pair or 4 pairs of shoes) that you send to Kindrunner is worth $10 KCR per new shoes purchased (5 pairs purchased on that order, you can earn up to $50 KCR) or credits towards future purchase. The KCR can be used to purchase anything on the Kindrunner website and will never expire! Expert Product Reviews: Each and every product that Kindrunner sells will include an expert product review video. The videos are done by people who have worked in the running industry for years! Kindrunner is bringing the knowledge of a running store to the comfort of your home! Easy 365 Returns: You have 365 days to return a product (no questions asked) as long as it is in its original condition and in its original packaging. First 500 Customers Reward: This is for the early customers of Kindrunner! If you are one of the first 500 customers...you get FREE SOCKS FOR LIFE!!!!! Each time one of the first 500 customers returns and purchases a new shoe...their order will ship with a free pair of socks of their choice in Kindrunner's sock inventory! I don't know about you but I LOVE all of these options at Kindrunner!!! But I think my most favorite part is knowing my old shoes will be repurposed and given to someone who needs them. Be sure to check out the kindrunner.com website today! Check them out on Facebook, Twitter, Instagram, and YouTube too! QOTD: What do you think about kindrunner.com?